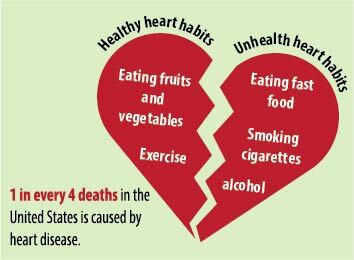 Heart disease is the leading cause of death for both men and women in America, according to the Center for Disease Control and Preventions. February is National Heart Disease Awareness Month, and Heather Kleeman, with Sanford Health, said it’s important for students to take preventative measures in their 20s and 30s to avoid getting heart disease later in life. Kleeman said the biggest thing she thinks college students can work on is their diet. Curtis Krempges, a nurse at Sanford Heart Hospital, said the ideal age for someone to get a heart screening is anyone between 40 to 75. Kleeman said people in their 20s and 30s don’t have a reason to check for heart disease unless they have a strong family history of it. “So if you’re exercising and you’re having difficulties breathing or pressure or pain in your chest than that would be something to go in and get checked out,” Kleeman said.